100% Ready To Run, Cloud Based, Video Commercials! Who Else Needs Video Commercials That Convert? April 1, 2016	 Comments Off on Who Else Needs Video Commercials That Convert? The goal for any marketing plan is to find the elements that convert and make your product move off the shelves. Or get bodies in the door, or get emails opened or subscribers on your list. Let’s face it, when we find something that works, we want to use it over and over. The problem is that not all videos that you create will work in other niches. But what if you could find a video that converted well in the same niche as you were trying to dive into? EZ Video Creator helps you answer that question. EZ Video Creator is a cloud based solution for the marketer who works with multiple clients across many niches. With a few clicks of the mouse, you can rearrange a winning video campaign to fit your client (or your own business). It comes with dozens of templates and niches to work with (and more are soon to be available). No rendering needed, you just fill in a form and BAMM! Your video is running with the info you just filled in. Need something changed? Make changes to the form and submit them for on the fly substitution! Check this out now while the price is at the lowest you will ever see it! -100% Cloud-Based. -Nothing To Install. Ever! 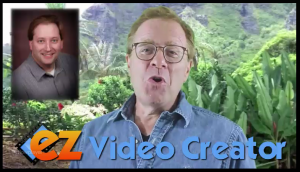 Get EZ Video Creator Now!